Users in over 68 countries worldwide appreciate the ruggedness, dependability, design and lifespan of our power distribution boxes. Their layout is designed for ease of use, with the power outlets at the front and circuit-breakers at the back. The housing’s edges protrude by 50 to 80 mm to protect outlets and circuit-breakers from physical damage. All power distribution boxes of this series can be perfectly stacked. Special fittings prevent the modules from sliding off each other. 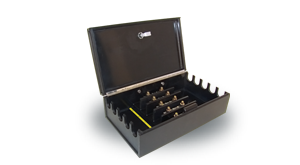 All eight corners of each distribution box are fitted with soft rubber shock absorbers. As well as protecting the boxes from impact, these prevent surface scratching of the enclosures. 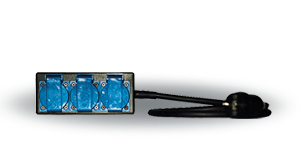 Our series 58 THERMOLENE® modules unite an exceptionally high stress resistance and electrical safety with the flexibility of the 19 inch design. Totally insulated, they are extremely safe in use and can be supplied in any height unit size and with any equipment. 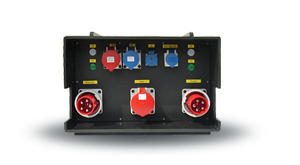 Main distribution boxes made from THERMOLENE® offer exceptionally flexible equipment and safety options. Thanks to the optimal airflow of the ventilation system, these distribution boxes can be operated at full load over prolonged periods. 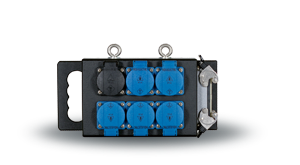 With their POWERLOCK plug connectors they can be laid out for a peak load of 600 A or, with terminal connectors for parallel 240 mm² cables, up to 800 A. 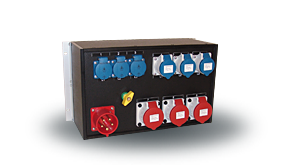 The power distribution boxes of this series are fitted in a stainless steel frame. Equipped with two stands they are ideal wherever the distribution box must be placed in snow, mud or puddles. Thanks to its stands these distribution boxes can also be safely transported with a forklift truck. The frame has flight case dimensions: width and depth are 600 mm each; the height depends on the distribution box’s equipment level. 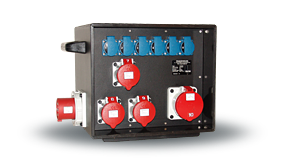 Our automatic transfer switches (ATS) control switching between a generator and mains power or between two generators. 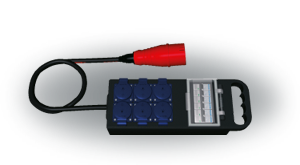 An ATS can control the entire switching sequence between a mains supply and a generator. In the event of a mains power failure, it isolates the mains supply, starts the generator and switches the consumers to the standby supply with specified delay times. 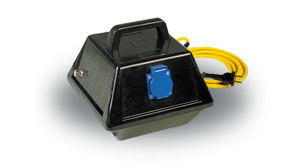 Our solid rubber distribution boxes are extremely rugged and reliable in use. 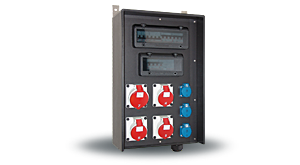 Their circuit-breakers are arranged inside the housing for optimum protection and can be quickly and easily accessed through a hinged cover. Handy, flat and lightweight: the key characteristics of the distribution box in briefcase format. Intended for indoor use, they can be flexibly equipped. 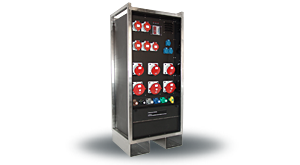 In addition to the listed models we can quickly and reliably implement any required configuration. 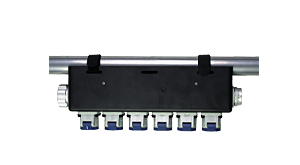 The modular design of these distribution boxes allows more than 100 combination options. At many events light is switched through the lighting console rather than being dimmed. For this purpose our NON-DIM distribution boxes are ideal. They allow lights to be controlled and addressed with DMX signals, supporting the DMX protocols of all popular lighting console systems. 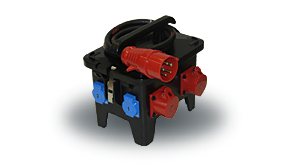 The compact INDU power outlet block has been designed for superior performance. Its solid yet lightweight housing is completely unbreakable. Unlike socket strips the outlet block features a replaceable socket, making the INDU outlet block good value for money. 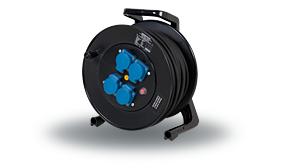 Built into a solid rubber housing, INDU transformers are extremely rugged, lightweight and low-noise in operation, making them ideal for use in the entertainment industry. Our transformers furthermore feature an exemplary safety standard. 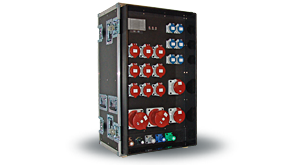 The built-in starting current limiter guarantees that the circuit-breaker is not tripped by high inrush current peaks. 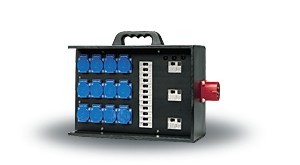 Our terminal box is ideal for connecting single-core cables from 1 x 50 to 1 x 240 mm². It opens like a suitcase to expose the terminals, to which single conductors terminated with an eyelet can be reliably connected. The closed box is lockable with a key. Our cable drums have been developed specially for extremely harsh treatment for use on construction sites and for the road. The diameter of the generous cable drums is dimensioned so as not to cause excessive bending of the cable. The carrying handle is of a lightweight sandwich construction that provides exceptional stability and is designed to maintain a distance from the body when carried. INDU-ELECTRIC multipole stage boxes of various configurations are used in more than 60 countries throughout the world. Together with their rugged construction and low weight, a long lifespan ensures that they maintain their value for a long time. Our truss boxes have a special fit and can be quickly and easily attached to a 50 mm pipe with two Velcro fasteners. INDU junction boxes have been used successfully throughout the world for many years, even under extremely harsh environmental conditions. 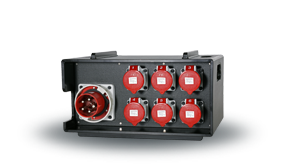 Like our mobile distribution boxes, our junction boxes feature an exceptionally high mechanical stress resistance and a long service life. In our modular production facility, we can produce these distribution systems to exact customer specifications and tailor them to specific operating conditions. 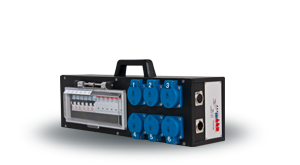 The MPPS (Mains Monitoring Protection System) module from INDU-ELECTRIC meets the requirements for effective protection at small building sites and for portable electrical equipment.